GUIDANCE: Cousin of Jesus Christ. Son of Zachary, a priest of the order of Abia whose job in the temple was to burn incense; and of Elizabeth, a descendent of Aaron. As Zachary was ministering in the Temple, an angel brought him news that Elizabeth would bear a child filled with the Holy Spirit from the moment of his birth. Zachary doubted and was struck dumb until John's birth. Prophet. Began his ministry around age 27, wearing a leather belt and a tunic of camel hair, living off locusts and wild honey, and preaching a message of repentance to the people of Jerusalem. He converted many, and prepared the way for the coming of Jesus. 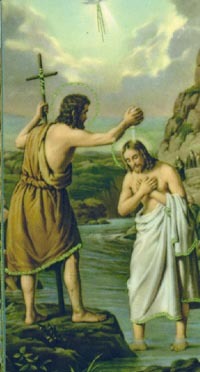 Baptized Christ, after which he stepped away and told his disciples to follow Jesus. Imprisoned by King Herod. Died a victim of the vengeance of a jealous woman. Beheaded, and his head brought to her on a platter. Saint Jerome says Herodias kept the head for a long time after, occassionally stabbing the tongue with his dagger.